In falling film evaporators, the solution is distributed evenly over the top tube sheet on the tubes and flows downwards in the form of a thin liquid film. The heat supply causes evaporation. The vapour steam and the solution both flow downwards. 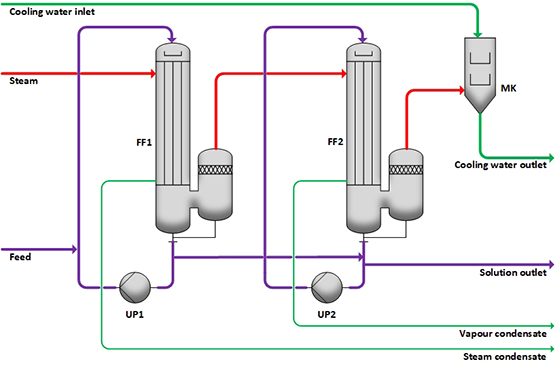 In the example shown, the solution is fed into the circulation line of the first stage and mixes with the circulating solution. In the evaporator tubes it is partially evaporated by steam. In the lower section of the evaporator FF1 and in the following separator, the liquid is separated from the vapour steam. The vapour steam flows to the second stage, which is operated under reduced pressure and serves as heating medium. The vapour generated in the second stage is finally condensed with cooling water in the mixing condenser MK. Compared to circulating evaporators, these evaporators have advantages in the evaporation of heat-sensitive solutions and solutions that do not tend to incrustation. Use of mechanical or thermal compressors to reduce steam consumption. Entry of the solution to be evaporated into the first stage (parallel flow) or into the last stage (counter flow). Accordingly, the concentrate is discharged cold (parallel flow) or hot (counter flow) from the plant.